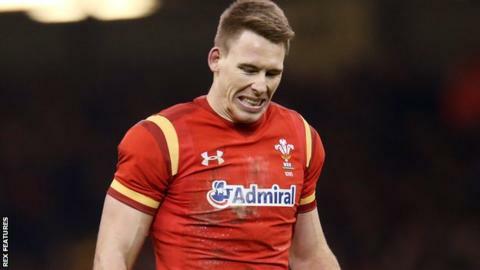 Scarlets are hopeful Liam Williams' hamstring injury will not keep him out as long as feared. Head coach Wayne Pivac had worried Williams might miss the rest of the regular Pro12 season. They host Glasgow on 15 April and meet Newport Gwent Dragons on the 30 April Judgement Day at Principality Stadium when Cardiff Blues also face Ospreys. "We'd like to think he'll be back for the Dragons, if not Glasgow," said Pivac. Williams missed the 25-16 win over Ospreys after suffering a hamstring strain in Wales's Six Nations win over Italy. Pivac has hardly seen Liam Williams in a regional jersey this season. He played the first hour of January's Pro12 match in Connacht after returning from the ankle injury he aggravated during the 2015 World Cup, but then returned to Wales duties. "Sixty minutes, that's all we've had, it's very disappointing but there's no-one more disappointed than Liam," admitted Pivac. "We've got to get him right for the latter part of the round-robin and who knows, with any luck there could be more rugby to come." The Scarlets are well placed to feature in the semi-finals of the Pro12 on the third weekend in May after beating the Ospreys. Replacement fly-half Aled Thomas profited from their forward dominance by kicking four late penalties to seal the win. Meanwhile centre Scott Williams, another World Cup casualty with a knee injury, is scheduled to return for the region at the Principality Stadium on "Judgement Day". "He'll be available for the Dragons (match), and we're working out whether we play him the week before at a lower level," added Pivac. The New Zealander praised his pack after the win over Ospreys, which saw the Scarlets cement their place in the top three of the Pro12. "Our scrum got on top as the game wore on and won some penalties which gave us field position and kicking some points from those penalties as well - which was ultimately the difference between the two teams," he said. "We'll celebrate this one but there's another big one in seven days time against Cardiff Blues."